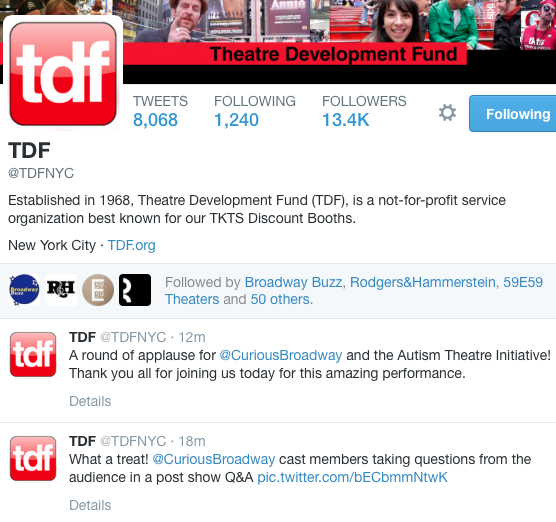 Here are some of the tweets about the Theater Development Fund’s first autism-friendly version of a Broadway play. If interested in taking someone with a disability to “Elf,” here are more details that also include sign-interpreted, open-captioned and audio-described performances, according to a recent Paper Mill press release. For a video of the “Elf” performance, click here. For an autism-friendly Video Gallery of the Paper Mill Playhouse, click here. For a New York Times articles about the autism-friendly performance of “The Curious Incident of the Dog in the Night Time,” click here. Paper Mill Playhouse will offer a special autism-friendly performance of Elf on Tuesday, December 23, at 1:30pm. This performance is designed specifically for children on the autism spectrum or with other developmental disabilities, and is planned in cooperation with Paper Mill Playhouse’s Autism Advisory Team. This is the second time Paper Mill Playhouse has expanded its autism-friendly performances to a mainstage production after a successful performance of Disney’s The Little Mermaid in 2013. The theater environment will be altered for this performance, providing a sensory-friendly, comfortable and judgment-free space that is welcoming to all families. The performance itself will be adjusted with special attention paid to lighting and sound. Additionally, Paper Mill Playhouse will host a free open house titled Meet Your Seat on Monday, December 22, 2014, from 4:00 to 6:00pm. This is an opportunity for children who are new to the theatrical experience to visit the theater space before the show. Often children with autism or other developmental disabilities become anxious in new surroundings, new experiences, and they need time to transition. The Meet Your Seat open house provides an opportunity for children to come to the theater in advance of the performance and take time to feel comfortable in this new space. Major support for autism-friendly programs is provided by the National Endowment for the Arts, with additional generous support by C.R. Bard Foundation, The Karma Foundation, The Merck Company Foundation, and, MetLife Foundation. Paper Mill Playhouse embraces a long history of providing access services to patrons of the theater. In addition to autism-friendly performances, Paper Mill Playhouse offers a wide variety of access programs and services including: sign-interpreted performances, open-captioned performances, audio-described performances, pre-show sensory seminars and barrier-free access theater-wide. Paper Mill Playhouse’s accessibility programs have been recognized by the National Endowment for the Arts, VSA arts/MetLife, and the New Jersey Department of Recreation as a role model for other performing arts organizations throughout the country. 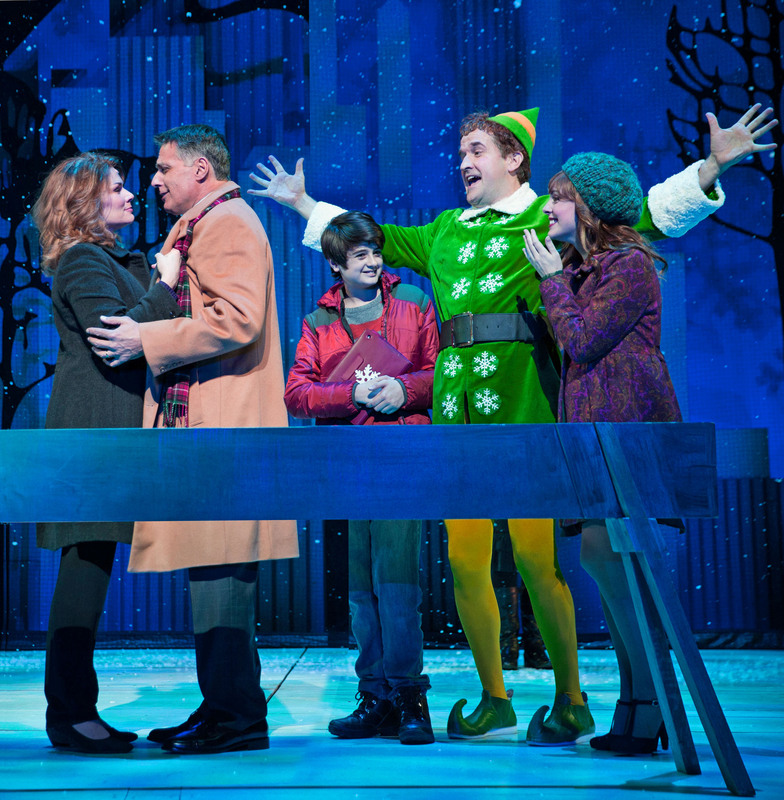 A scene from Paper Mill Playhouse’s production of “Elf” featuring, from left, Heidi Blickenstaff, Robert Cuccioli, Jake Faragalli, James Moye and Kate Fahrner./Photo by Matthew Murphy.